Trying to understand what color correctors or concealers do for our skin can be a little confusing therefore we need to understand our skin first in order we can understand what correctors can actually do. The skin is made up of four types of pigments, which are oxygenated hemoglobin, reduced hemoglobin, carotene, and melanin. Oxygenated hemoglobin is what makes the blood red. Reduced hemoglobin is what make the veins in our skin look blue. Carotene gives the skin a yellow color, while the melanin darkens the skin when the skin is exposed to UVs from the sun. Depending on which pigment is higher in your skin, your skin can take on red or yellow which are considered warm in the makeup industry versus blue which is considered cool. There are so many color correctors out there on the market for every skin type and discoloration. They come either in liquid or creamy concealers and tend to come in a bold colors such as green, purple, orange, and blue. They neutralize the skin discoloration, giving you an even skin tone. If you have a beige skin tone and have blue blemishes such as a bruise on your body, then a yellow color corrector will neutralize the blue. If you have green discoloration, then a pinkish corrector will even out your skin tone. If you have warm-toned skin or Indian skin, and tend to have grayish discoloration around the mouth, forehead and even around the eye area, then an orange color corrector is for you. People with less melanin or pale skin that shows some redness around the mouth, nose or eyes should use a green color corrector to camouflage the redness. 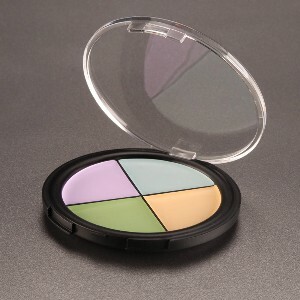 Those who have yellow pigments in their skin tone should make use of a purple color corrector. Applying the color corrector or concealer over your blemishes is easy to do. Grab a concealer brush and dab it into the corresponding color of your choice. Once you concealed the blemish, apply foundation all over the face and set it with some finishing powder of your choice. Have fun experimenting with concealers!